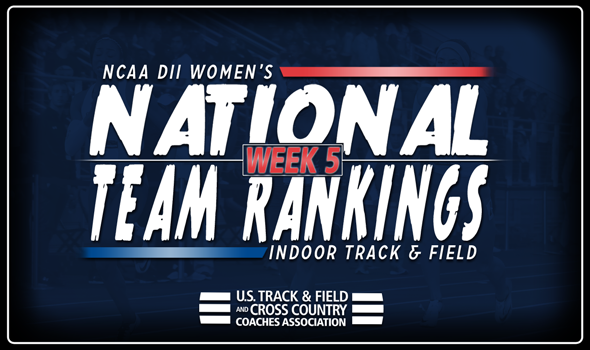 NEW ORLEANS – While there was a significant change at the top of the NCAA Division II Men’s National Team Rankings, the same cannot be said for the women’s rankings this week. Grand Valley State, West Texas A&M and Adams State remained in the top-three spots, respectively, in the Women’s Team Rankings, announced by the U.S. Track & Field and Cross Country Coaches Association (USTFCCCA). The Lakers of GVSU saw Bobbie Goodwin notch the sixth-best weight throw mark of the NCAA Division II season at their home Tune Up this past weekend at 19.31m (63-4¼). Adams State also saw a couple of top-10 Descending Order List marks at the Texas Tech Matador Qualifier, as Dianna Johnson’s 7.53 in the 60 is good for sixth, while Jenna Thurman’s 3000 finish at 9:36.10 ranks seventh. Western State was the only team in the top-five to move up in the rankings, jumping one spot to fourth. The Mountaineers benefitted from the performances of a couple of mile runners in Alicja and Aneta Konieczek. The sisters posted the sixth and eighth-fastest mile times at 4:47.27 and 4:48.87, respectively, in on the Descending Order List at the Western Alumni Open. Rounding out the top-five was Pittsburg State, who fell one spot to fifth. Two teams who saw a nice boost in the rankings a week ago continued their climb in Azusa Pacific and U-Mary. The Cougars got three top-25 NCAA Descending Order List marks this past weekend to move itself up to seventh from ninth. The Marauders also moved up two spots to eighth after its distance medley relay squad posted an 11:42.21 at the Stinger Open, good for eighth on the Descending Order List. Angelo State remained in sixth for the second-consecutive week, while San Francisco State and Bellarmine fell to ninth and 10th, respectively. Saint Augustine’s made a significant push into the top-25, jumping 25 spots to 15th for its highest ranking on the season. Also moving into the top-25 on the week was Concordia (Ore.), which moved up seven spots to 24th.